Smooth brilliant fabric paints for light-coloured fabrics,with a creamy texture and good fabric penetration. 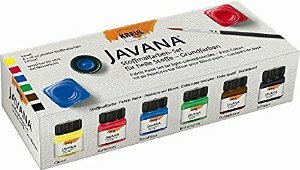 The set includes 6 x 20ml paints in Lemon, Carmine Red, Royal Blue, Brilliant Green,Dark Brown & Black, along with a brush. Use on fabrics made or cotton, viscose, and blends of up to 20% synthetic. Heat-set, water-based.